El Escorial is by far the cutest town I’ve been to yet! I went with some friends on Saturday and we had the perfect girls trip. 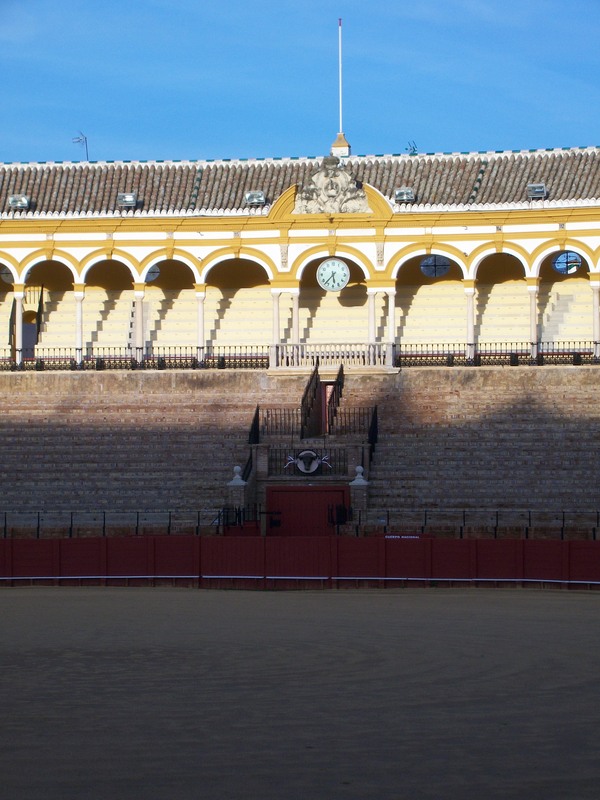 We wandered around the town for a couple of hours before going into the palace. It’s right at the base of some mountains and every nook and cranny is adorable! 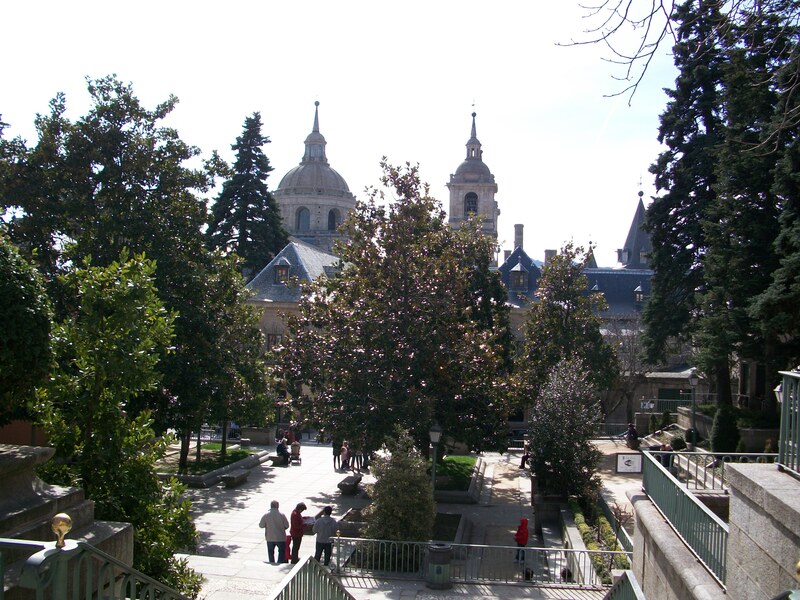 Right in front of El Escorial are a bunch of charming restaurants and cafes, tree-lined streets and sunny plazas. 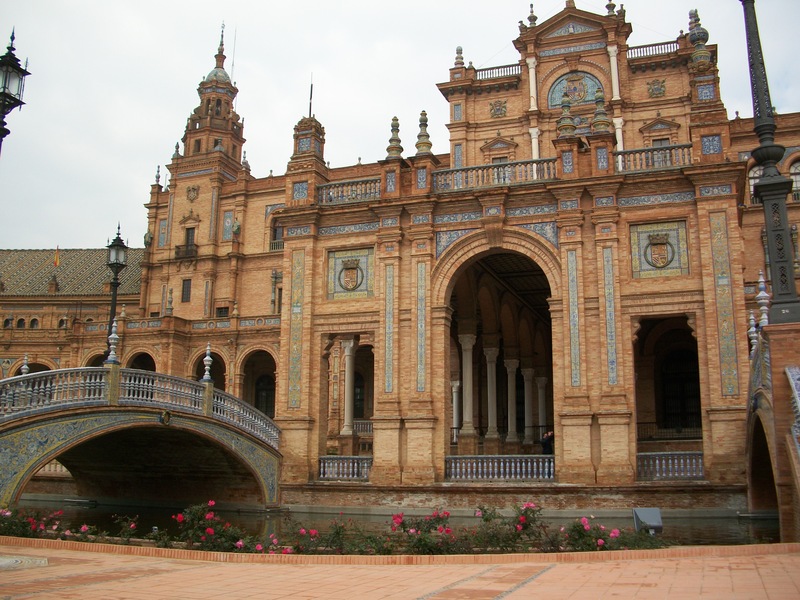 The weather was so nice that we had a picnic lunch in one of the plazas, then we got in line to see the palace. 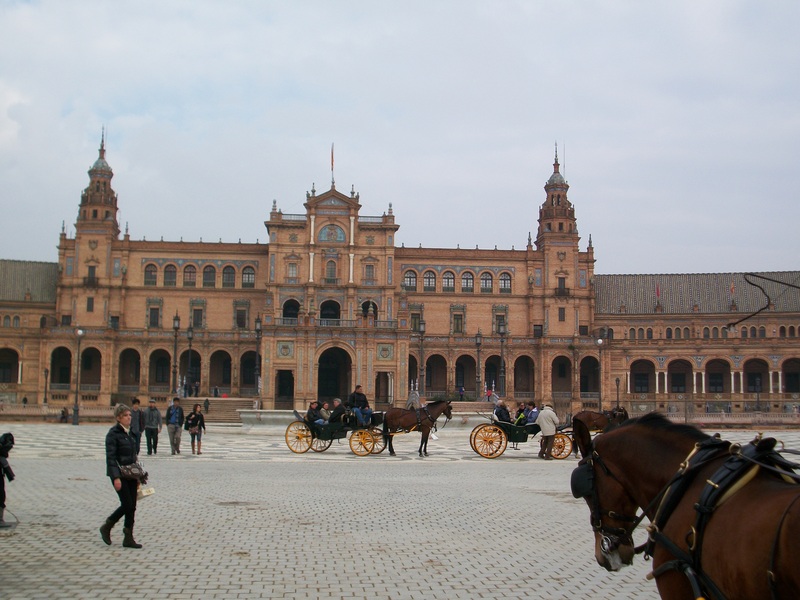 Overlooking one of the plazas with the palace in the background. 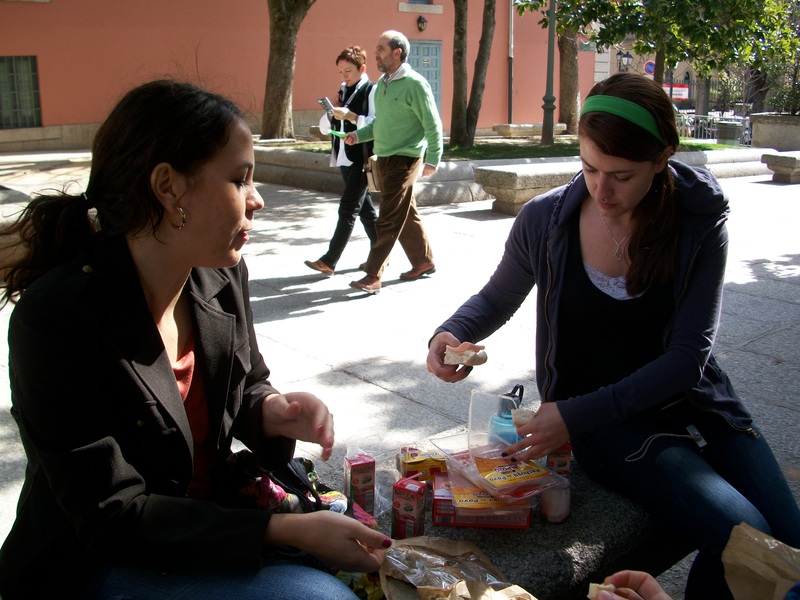 Amanda (right) and Kyla making sandwiches. "It's not a picnic without juice boxes." The palace is ENORMOUS! We must have only seen a quarter of it, and that took two hours even though we moved at a good pace. (I don’t know it the entire palace is open to the public, though.) Besides it being chilly inside (stone walls will do that!) it was really interesting. There were tons of different types of rooms. 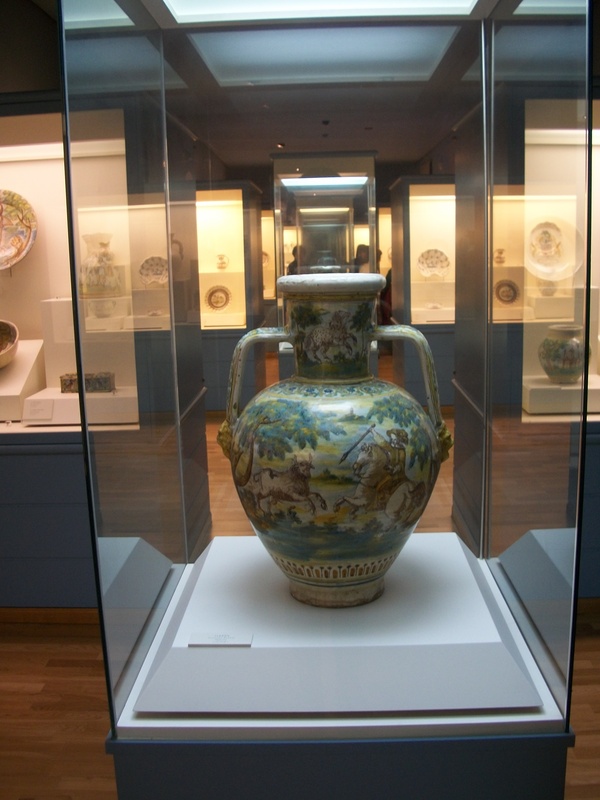 We walked through a construction museum, art collections, the king’s bedroom, a crypt, a library and more. 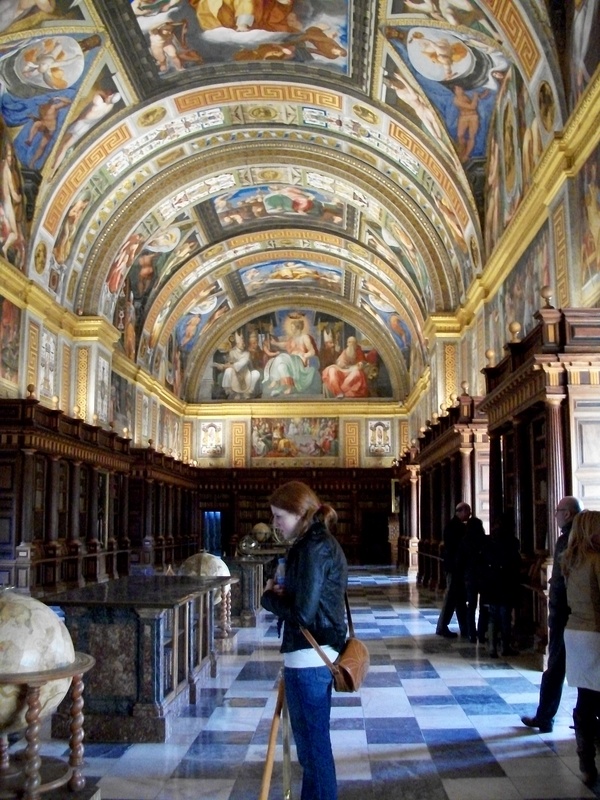 My absolute favorite parts of the palace were the ceiling of the basilica and the library. Even though you aren’t allowed to take pictures, I took plenty to share with y’all! AMAZING! 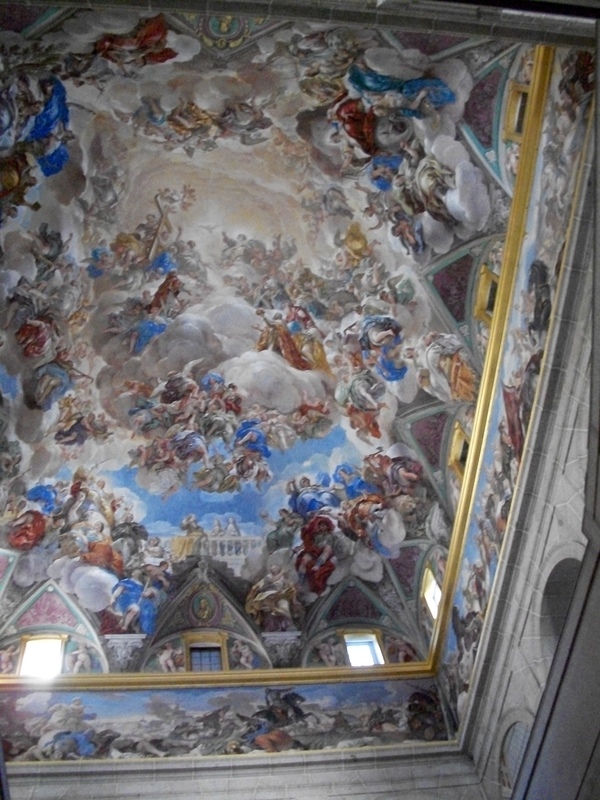 Murals like this continued into the chapel area as well. There must have been at least five of them. We stayed until El Escorial closed then went across the street to the most precious cafe. It was a little girl’s dream for grow-ups! 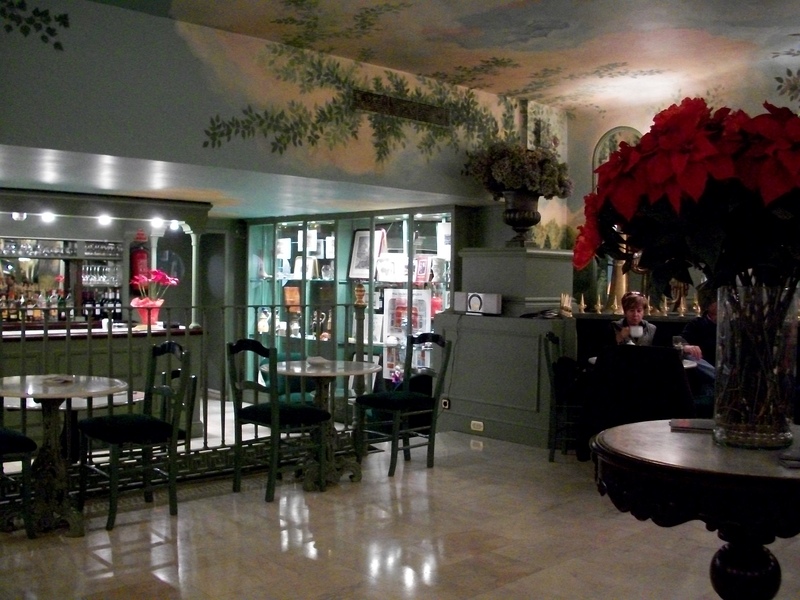 Everything was antique looking and a garden mural covered the walls and ceiling. They only served tea, coffee and hot chocolate (and maybe a few snacks). 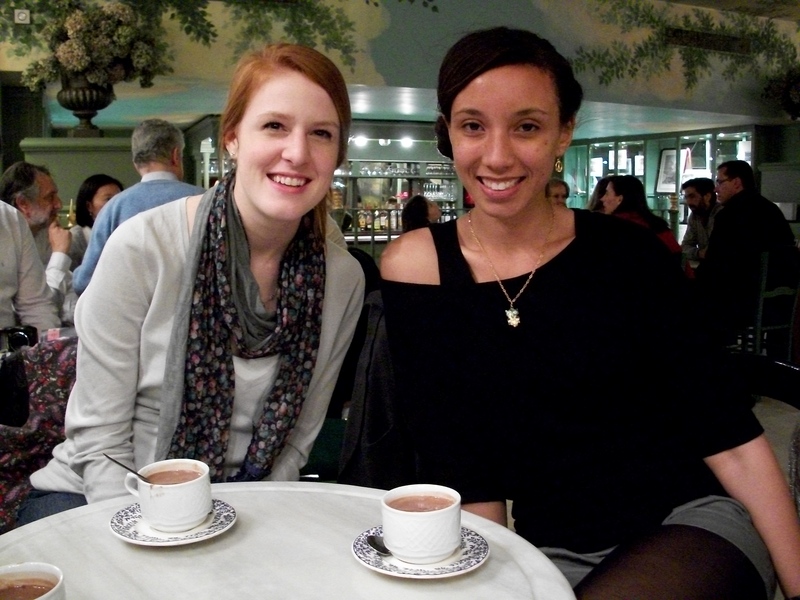 The hot chocolate was the best I’ve had in Spain so far and the tea was Earl Grey (impressive, haha).We were definitely those girls being giddy and taking tons of pictures. Perfect end to the day! My boyfriend and I got back to Madrid after 12 straight days of travel last Saturday night happy, exhausted and a little dirty (we had lost the shampoo and conditioner we had brought a few days before coming home). Our trip was absolutely AMAZING! In the end, we got the chance to hang out in 5 different cities in 3 different countries. We took tons of pictures and videos (most of which I will put on Facebook rather than here), but I’ll just give y’all some of the highlights. 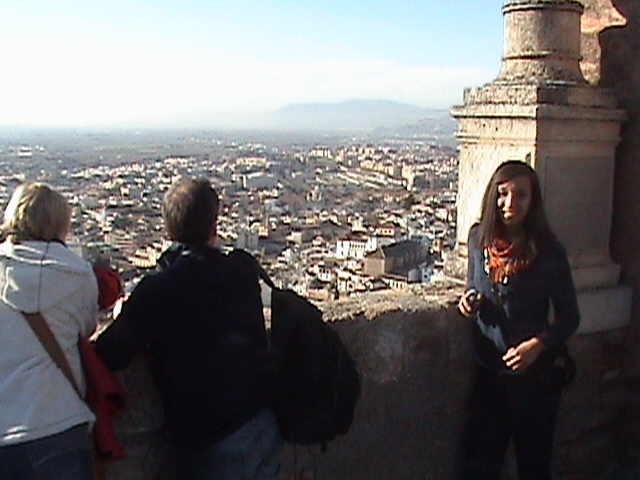 Our first stop was Granada, Spain. 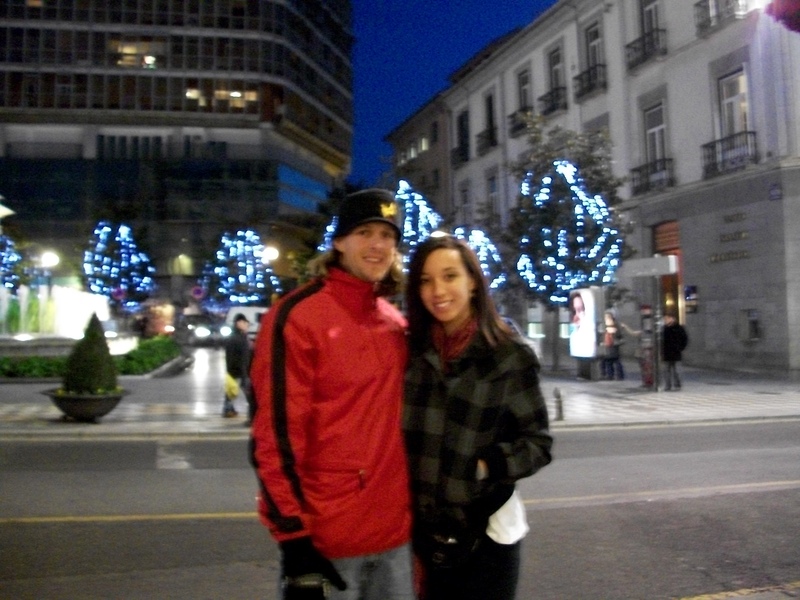 Granada was such an adorable city. The highlights for me were La Alhambra and the live flamenco show! 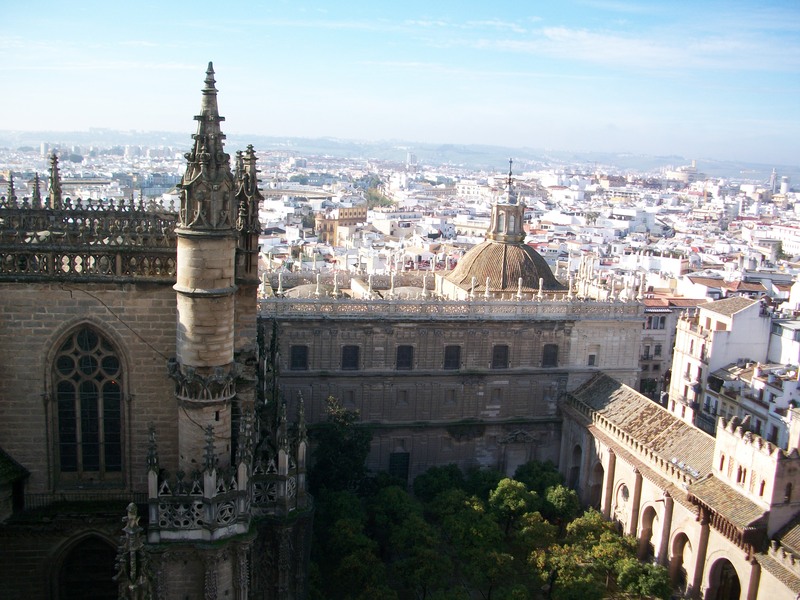 We also liked the Cathedral, which was beautiful, and a bar we found with good American music… aka lots of Rhiana (Spaniards love her!). First day in Granada! Not as cold as Madrid but still chilly! 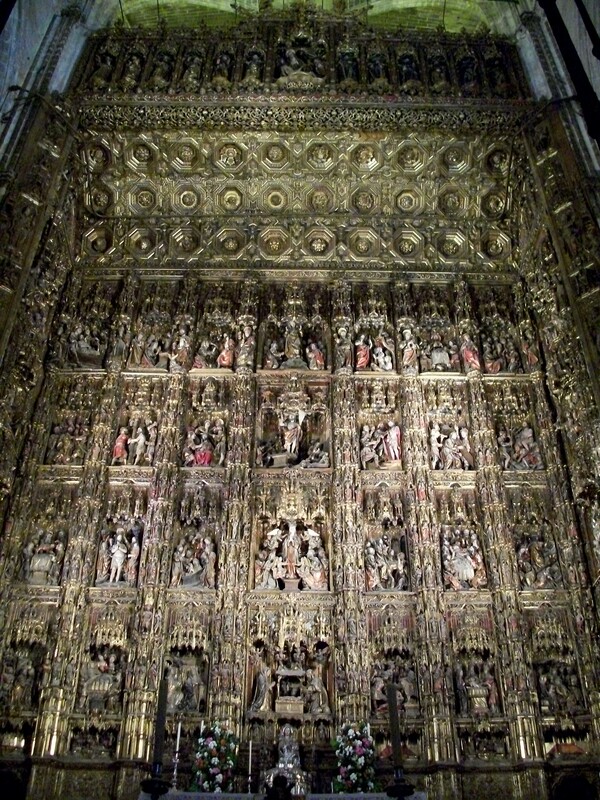 The first day there we went to the Cathedral and Royal Chapel. It was the biggest church with some of the prettiest architecture I’d ever seen until visiting some of the other places we went on our trip. Either way, it’s still in the top 5! 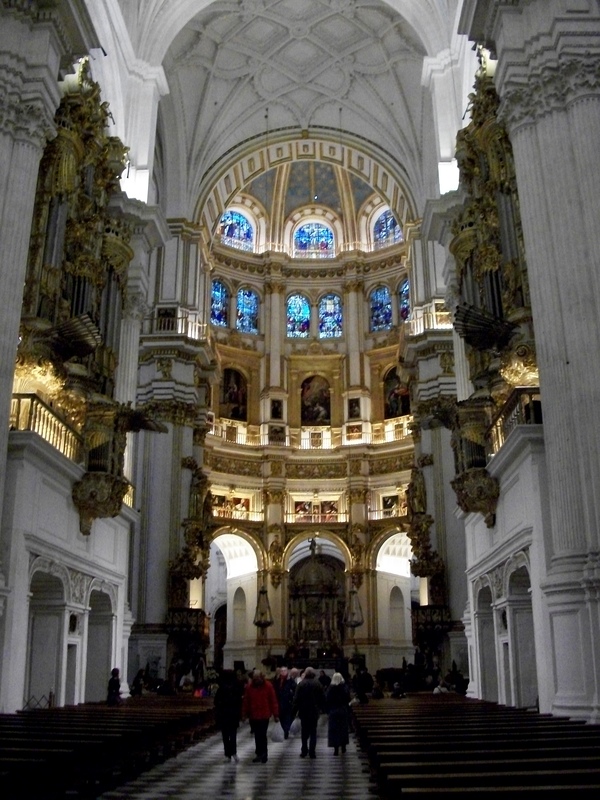 My favorite part of the Cathedral was the organ, it blew me away! 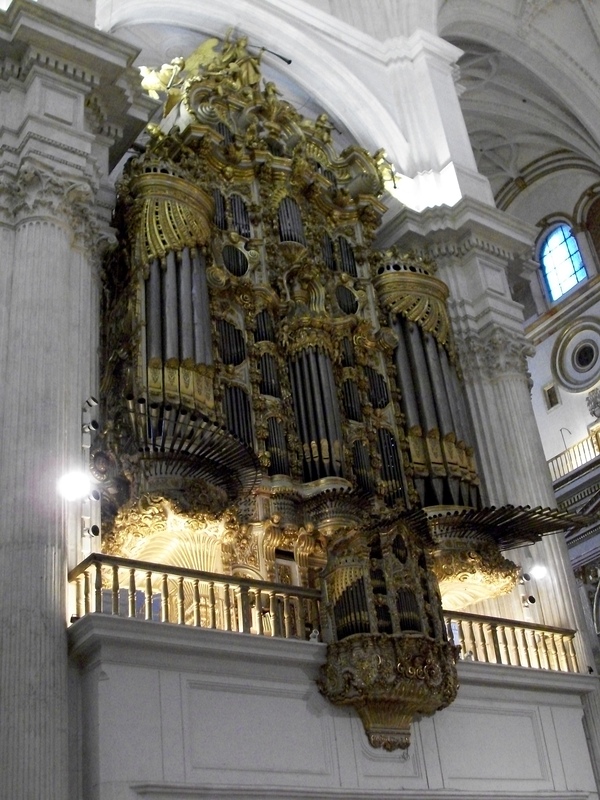 This is one of the two sets of organ pipes in the middle of the Cathedral. 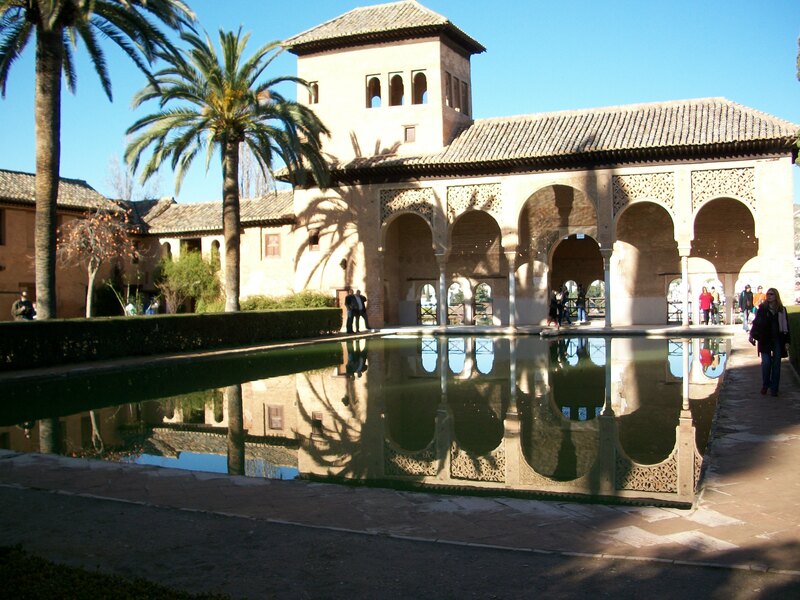 This courtyard-oasis was my favorite part of La Alhambra and is one of the oldest parts of the palace. 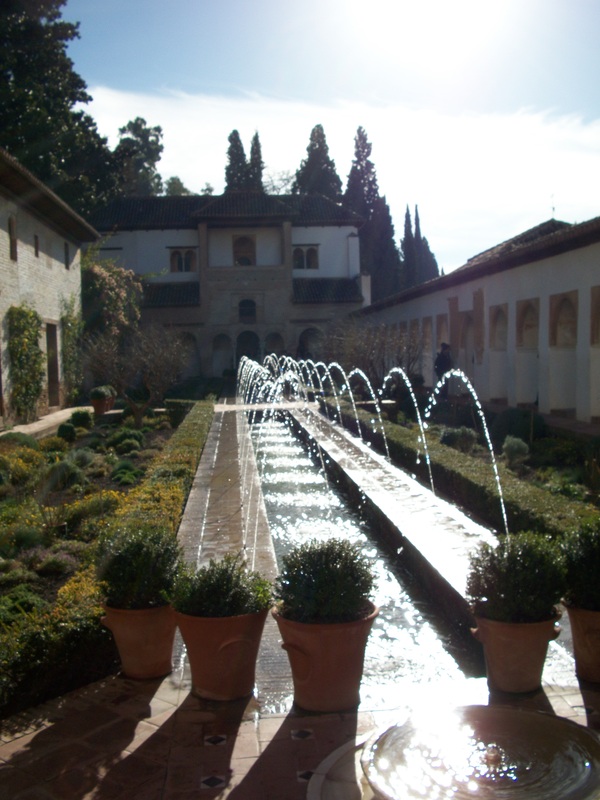 Shot from the Generalife Gardens across from the actual palace. Great view from the top of La Alhambra! 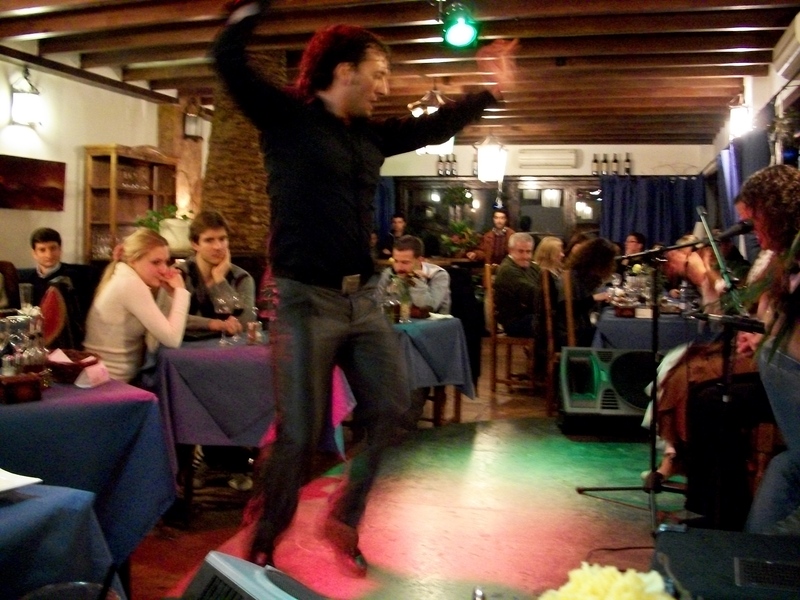 That night, we went to a flamenco show for dinner. So far in Madrid, I had only seen a Flamenco ballet, which ended up being mostly ballet and maybe 10 minutes of what I thought Flamenco would be. This show was REAL flamenco! I couldn’t blink I was so into the solos and watching the footwork. The restaurant-bar had great drinks and tapas and the dancers danced their butts off! Dinner was good. Beau really liked what he ordered-it was probably his favorite meal the whole trip. I ordered shrimp (yes, for my time abroad I have gone from vegetarian to mostly vegetarian but sometimes pescatarian). The shrimp, or maybe more appropriately called “prawns”, had their heads and everything else still attached. After eating a little of two of them that Beau had to de-head and gut for me I gave him the rest and remembered why I decided to be a vegetarian in the first place, LOL! 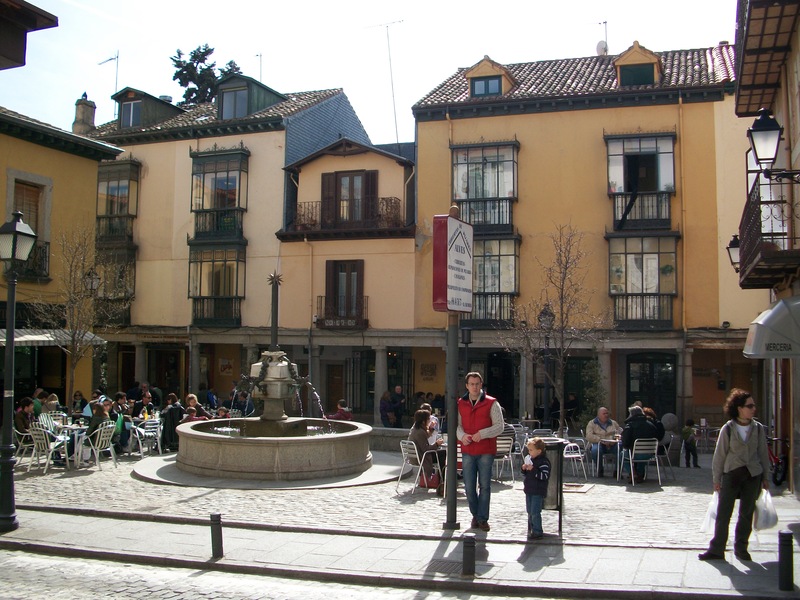 Granada was very different from Madrid. You could definitely see the Arabian influence in all of the Moorish architecture, which made it the perfect destination before heading to Morocco… More to come! 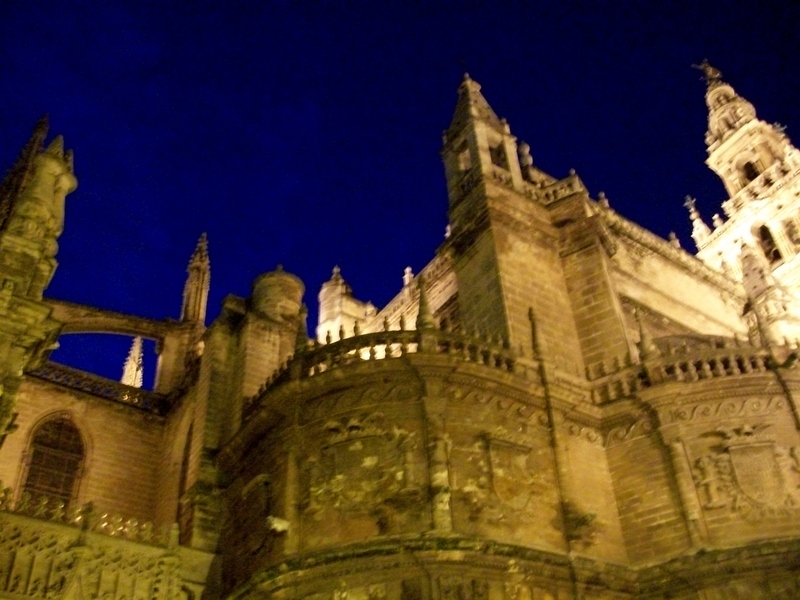 I loved Salamanca! As in I loved it so much I maybe want to move there. Yesterday/today has been a very long and very awesome day. I went into work Friday to help with Halloween even though I am usually off. I only worked a half day then went home to nap before the long night ahead. 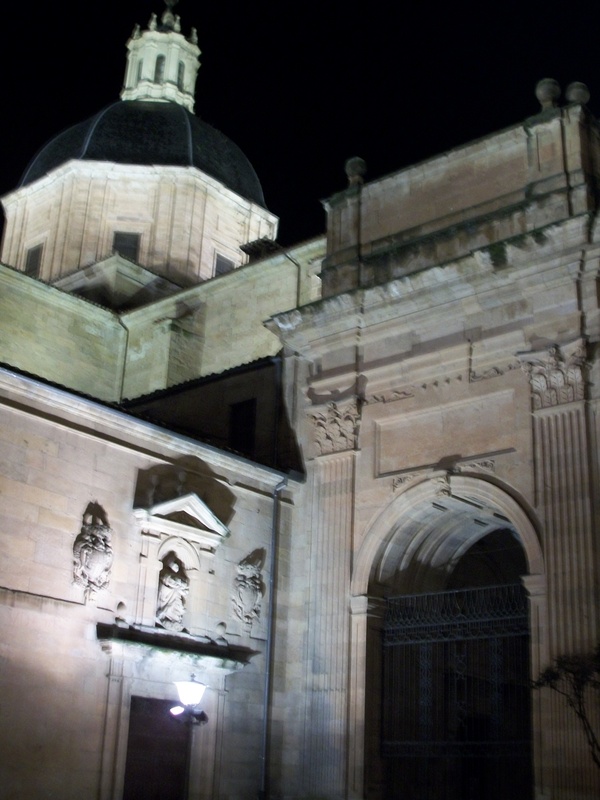 Around 5 p.m., two of my friends and I bused to Salamanca. Our game plan was to party until about 6 a.m. and catch an early bus back to Madrid so we wouldn’t have to pay for a hostel, and that’s exactly what we did! 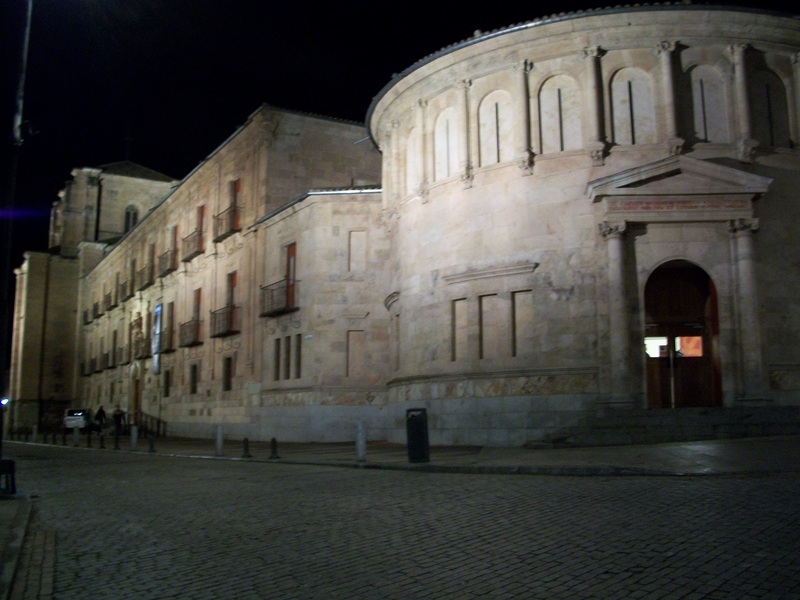 Salamanca is a beautiful university town. The cathedral (not sure if it was the old or new) was so impressive to drive up to when we got there. 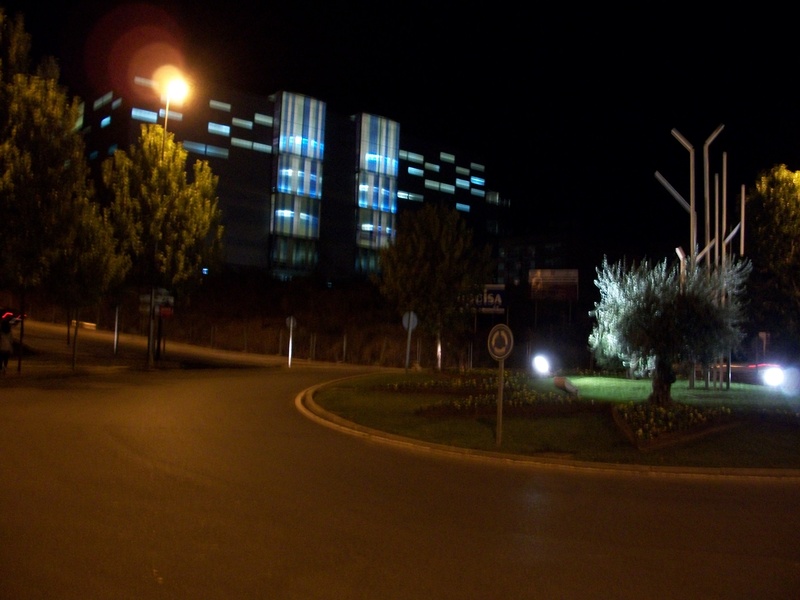 Every building looks like it’s part of a castle and is lit up at night, so the whole town has an enchanted feel. I definitely want to do this trip again with a little more day time to see the cathedrals and art museums…and then go out and dance until 6 a.m. again, of course! 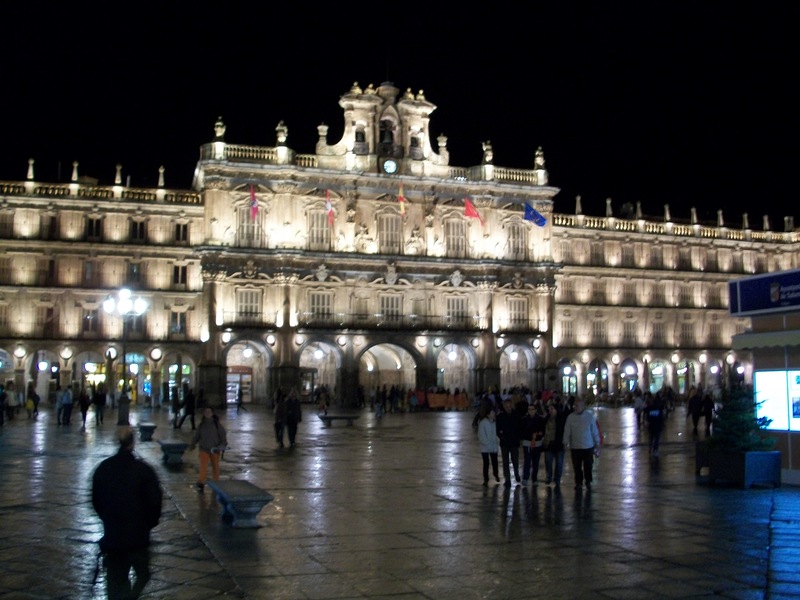 When we got to Salamanca, the first thing we did was eat dinner. We wandered around looking at menus until we found a French/Italian place that was tucked away in a basement. It had great food AND service, which was very refreshing considering the general lack of customer service in Spain. We were at dinner for 3 hours! But drawn out lunch, dinners and coffees are normal here and it’s kind of nice not to feel like the waiter is trying to kick you out. 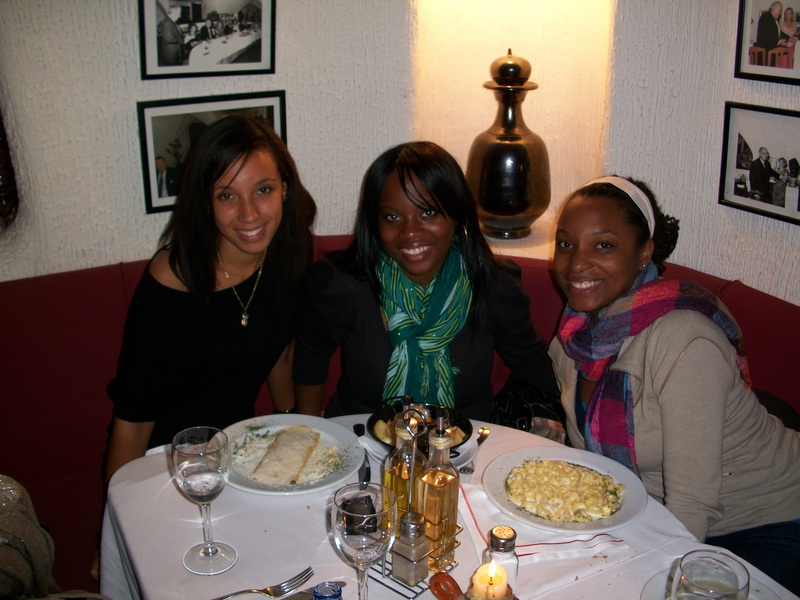 I had a four cheese crepe, Jeta ordered the menu del dia (3 courses) and Siury had four cheese tortellini. Yum! 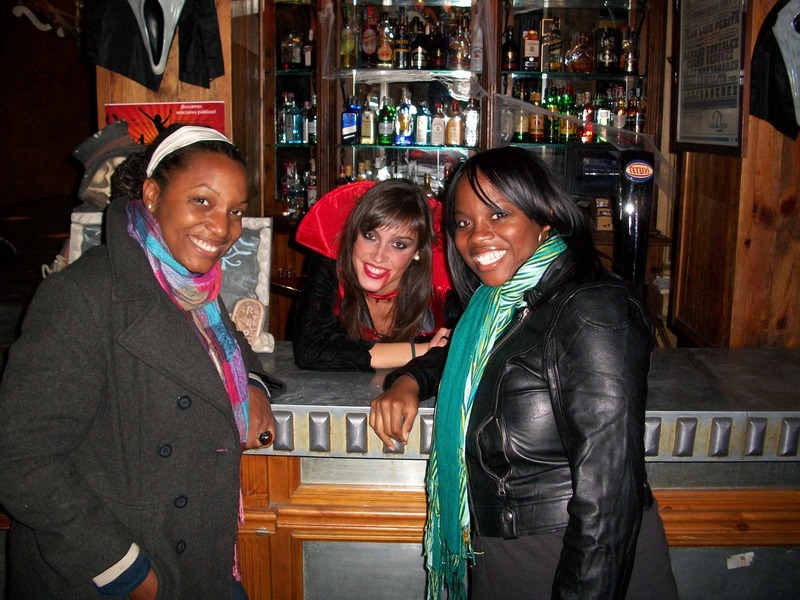 After dinner, we found a bar that was DECKED OUT for Halloween, so we went inside. 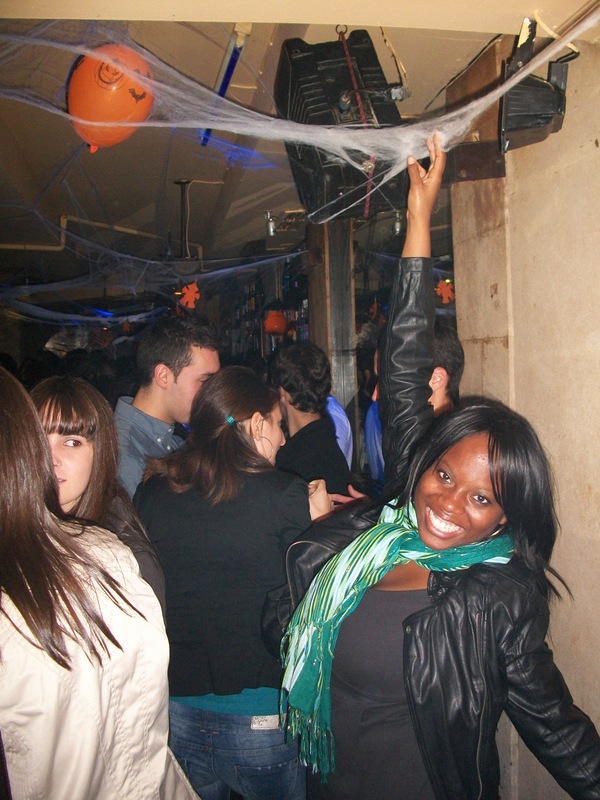 (We later realized that most of the bars were decked out for Halloween, but it was still really cool.) It was 12:30 a.m. and the place looked like it had just opened, which it had. The bartenderess was awesome and would definitely be our BFF if we lived in Salamanca. She gave us free shots and only charged us for probably less than half of what our drinks actually cost. The music was great (Latin and reggaeton) and the bar was packed within half an hour of us getting there. The next bar had good Latin music and was decorated for Halloween, too. It was also populated with by far the most forward Spanish men I have met since I’ve been in Spain. My friends an I were literally running away from them most of the time, lol. Not that moving away or telling them I had a boyfriend deterred them very much. Over all they were fun and funny. The next bar was a shot bar where we met some more cool people and my friend and I tried Absent for the first, and last, time. (It tasted like licorice and burned on the way down so I had a glass of ice water after it.) The last stop of the night was a discoteca. We hung out until about 6:15 a.m. then headed to the bus station to eat breakfast and catch the 9:30 a.m. bus back to Madrid. We all agreed on going back in the Spring as soon as we were back in Madrid! Here’s a picture timeline of the night. Siury and Jeta with our awesome bartenderess and new bff. 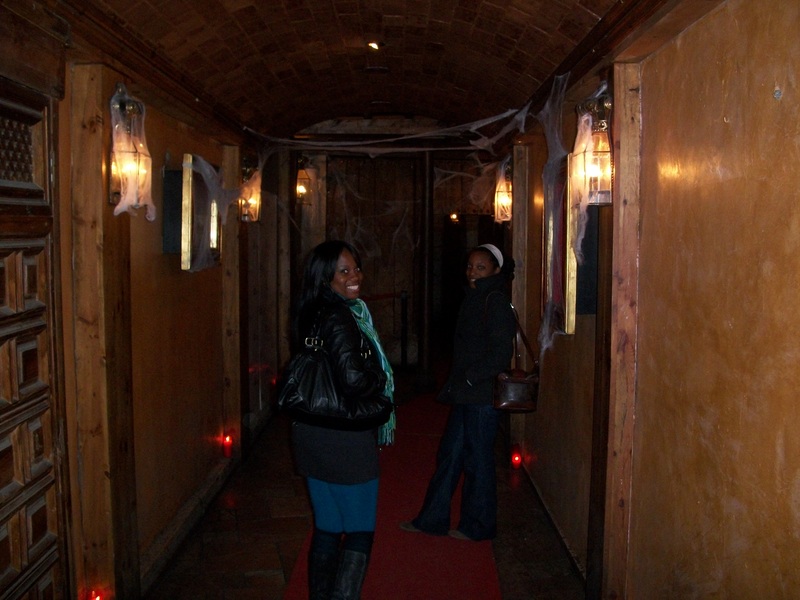 Spooky entrance that drew us into the first bar. 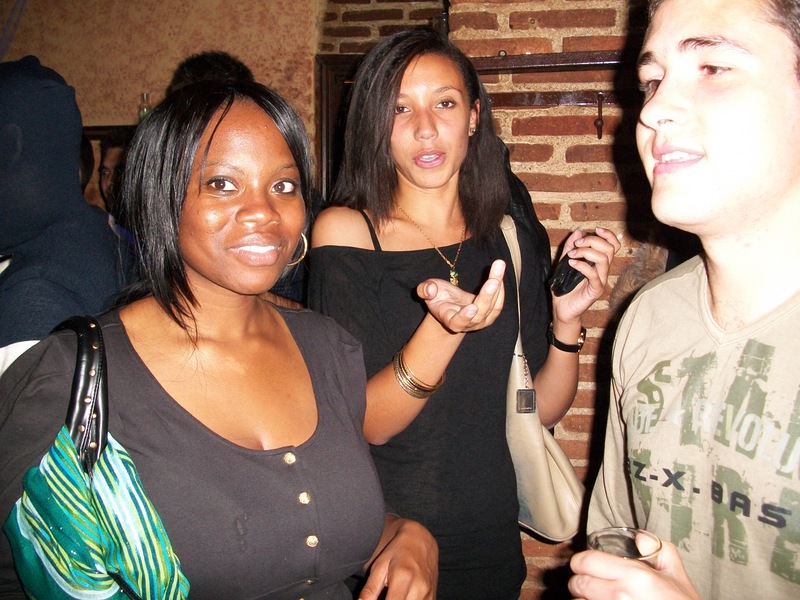 This picture captures our feelings toward the forward Spanish men at Bar #2, ha. 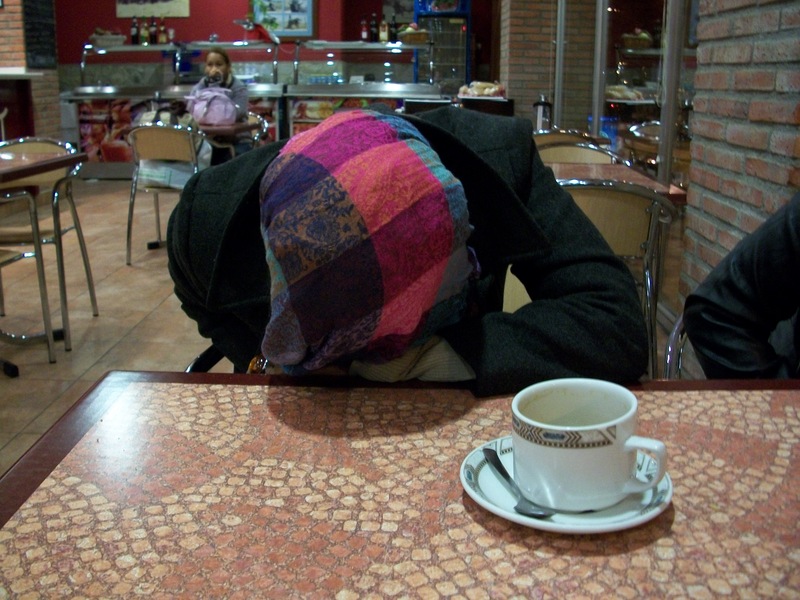 Fast forward to 7:30 a.m., Siury sleeping in the diner. Time to go home. However many weeks ago that I went to Kapital (la discoteca) was when two of my friends met a few basketball players. They’ve kept up with them, so the players gave us tickets to their game last night. Before anyone gets too excited about hanging out with famous basketball players, let me clarify that this was not the main international league here, it was the “B” team. But that’s not to say that it wasn’t fun! 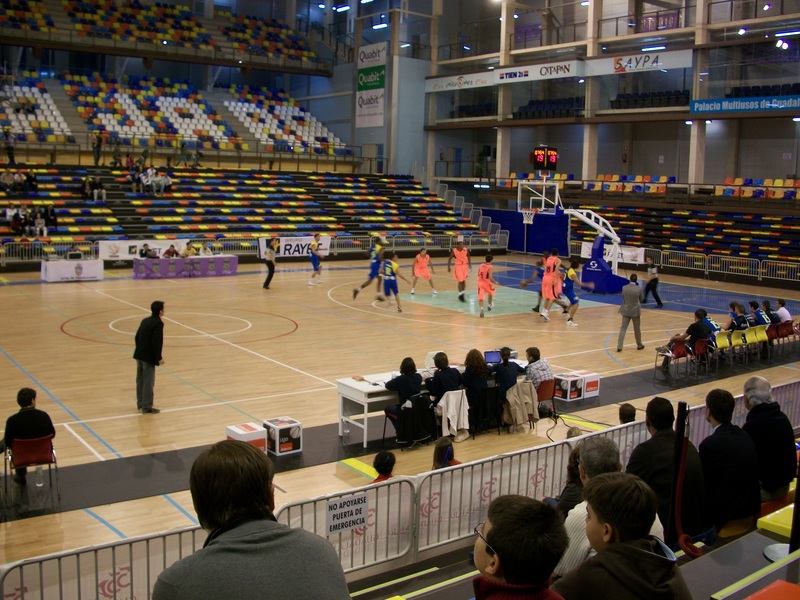 The game was Guadalajara vs. Barcelona. 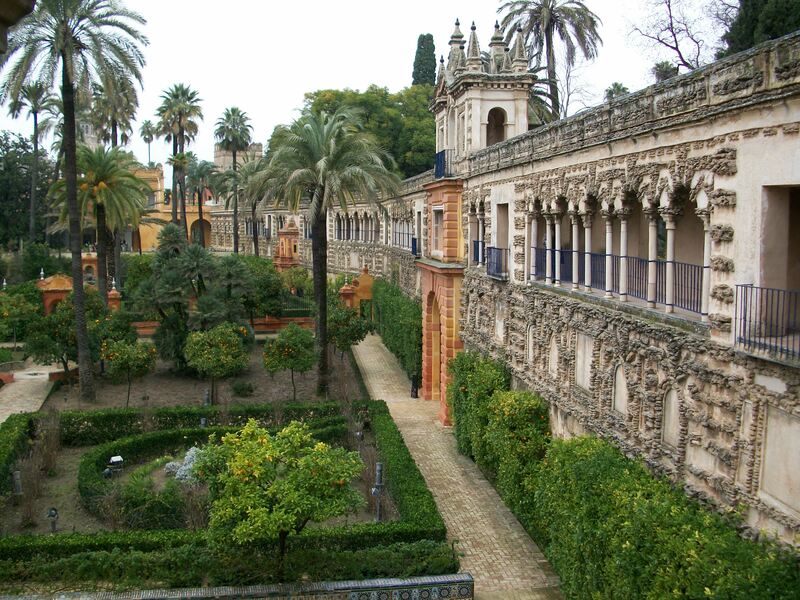 (Guadalajara is about an hour away from Madrid by train. It isn’t a very pretty city, unlike the rest of what I’ve seen and heard about Spain so far. I did see one very pretty church, though.) Guadalajara, the team we came for, lost. It was funny to see the old Spanish men get so into the game. Before half time there was a discrepancy with the shot clock and literally our entire side was up arguing and making hand jesters like you see Italians do in the movies. An old man behind us made awesome comments in Spanish about the team being slow and sleepy. Talking smack in Spanish is so much cooler and prettier than in English. 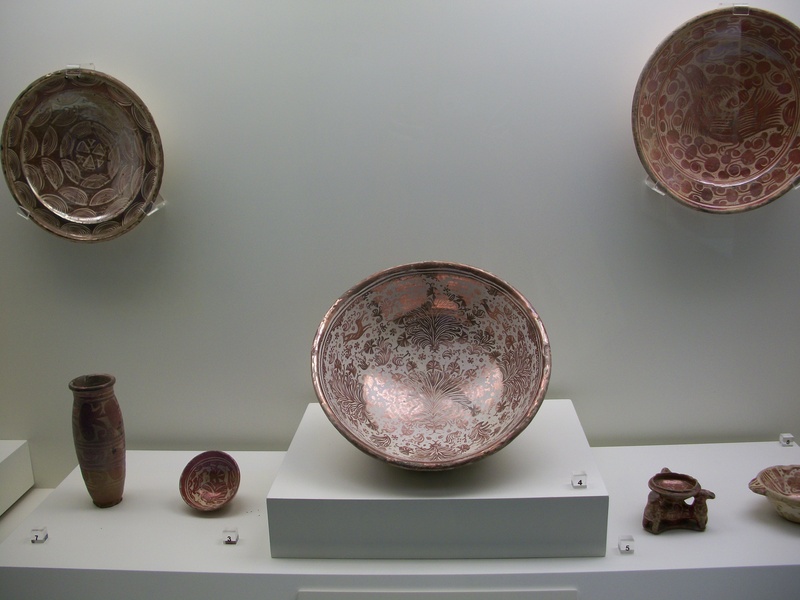 I must get this from my mom, but I’ve always loved beautiful pottery. 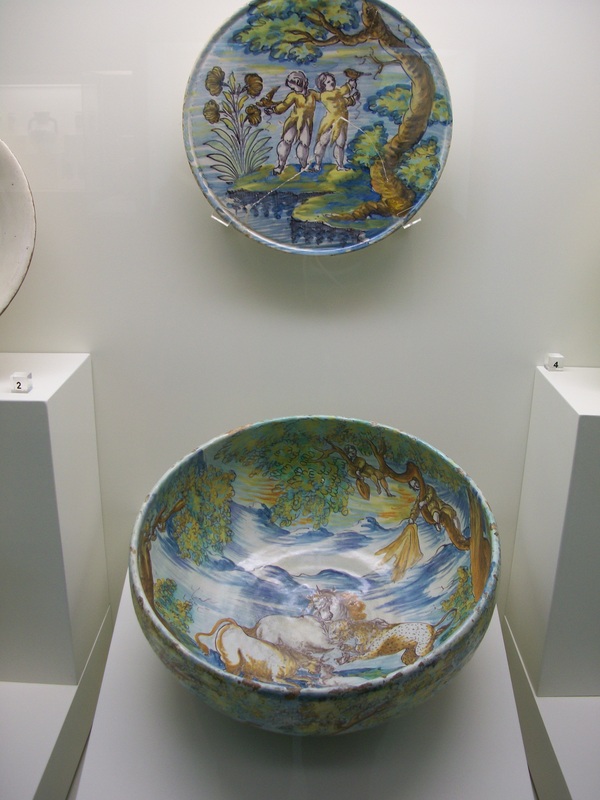 I especially love the tile, vases, bowls and plates that make up the Carranza collection at Santa Cruz Museum. All of the pieces are from different areas of Spain but share a very Mediterranean look (in my opinion, but I’m no expert). 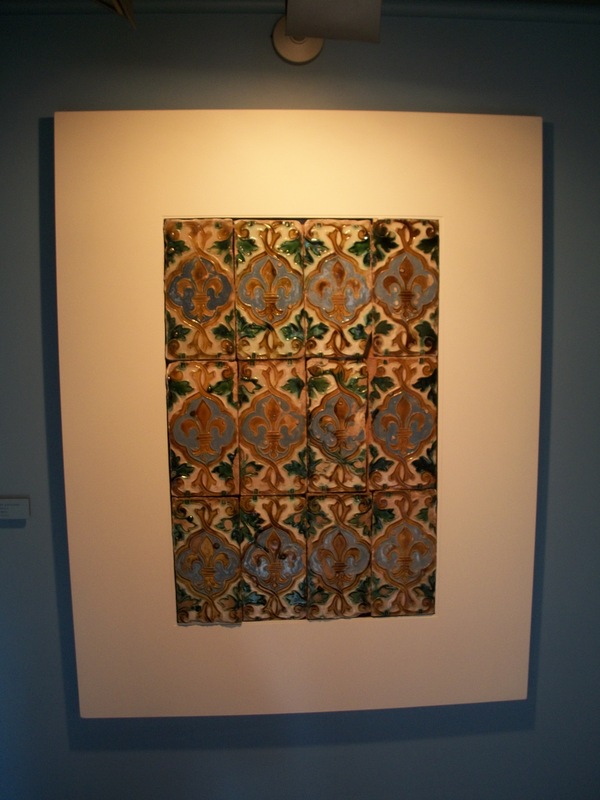 The white backgrounds are painted mostly with blue and yellow and sometimes green or with metallic bronze and silver colors. 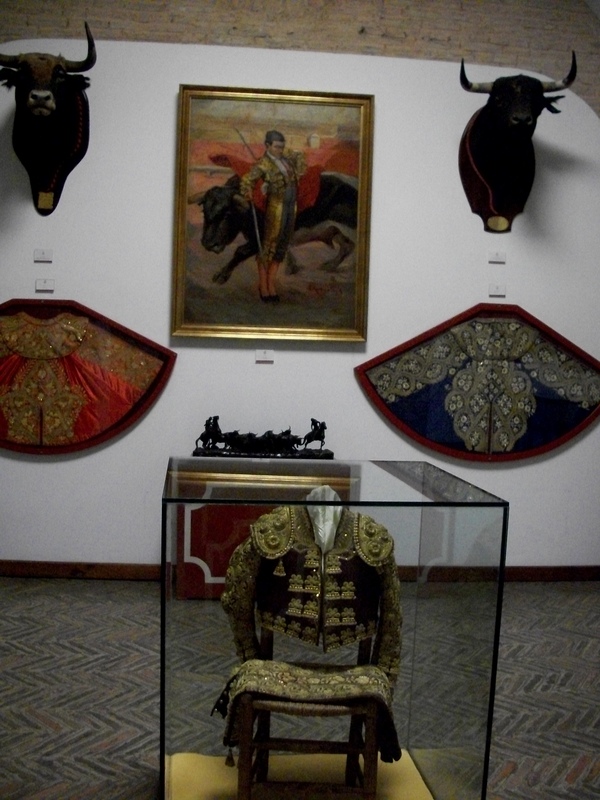 Some of the pieces are decorated with various designs and others show depictions of legends and history. The depictions were my favorite. I took my time walking through this exhibit, looked at everything and took lots of pictures.